On Thursday evening, the House of Representatives passed the two-year bipartisan budget deal hammered out by Representative Paul Ryan and Senator Patty Murray by a vote of 332 to 94, with support from 169 Republicans and 163 Democrats. The agreement, which replaces some sequestration cuts and reduces the deficit by $22.5 billion over the next decade, is generally considered a pretty modest proposal, but that didn’t stop conservative groups from railing against it. The Senate is expected to pass the bill and the president has said he will sign it, so it’s unlikely we’ll see a government shutdown in the near future. But the more immediate benefit was getting to watch House Speaker John Boehner flip out on the deal’s conservative opponents at his weekly press conference. Politico reports that there hasn’t been much of a response from the groups, but Representative Tim Huelskamp, a Heritage ally, did float the idea that Boeher felt comfortable lashing out at fellow conservatives because he won’t be speaker for much longer. “I don’t think the speaker’s too worried; the rumor is that he’s not going to be here in a year and a half,” Huelskamp said. 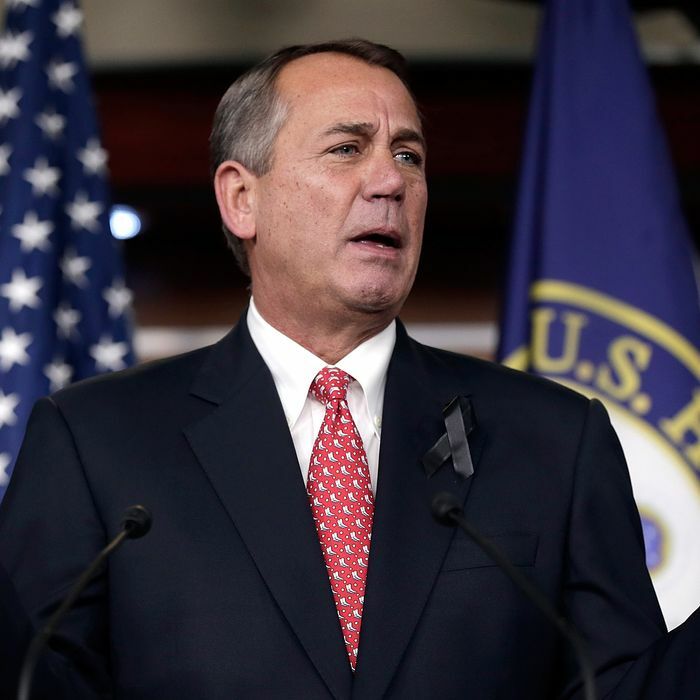 Boehner has said that he intends to run for reelection and remain speaker – not that he’s particularly interested in the conservative groups’ thoughts and actions from here on out. “I don’t care what they do,” he quipped, closing his last press conference before the holidays by telling reporters “Merry Christmas.” Consider Boehner’s comments, in both video and Vine form, his early gift to the Internet.